The final map in this series detailing Poland following its dismemberment in the 1785 Third Partition. A New Map of the Kingdom of Poland, with its dismembered provinces and the Kingdm. of Prussia. This important 1799 map by Laurie and Whittle depicts the Kingdom of Poland following the 1795 Third Partition. The map covers from Brandenburg to Russia and from the Gulf of Livonia to Moldova and Hungary, including all of Poland and the former Grand Duchy of Lithuania, parts of Prussia, Russia, Livonia, Hungary, Germany and Austria. 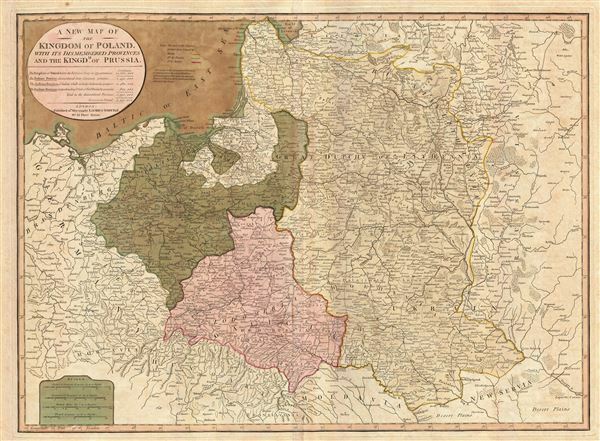 This map depicts Poland in 1799, four years following the 1795 Third Partition of Poland. Here Russia has annexed more the entire western half of the former Polish-Lithuanian Confederation. Austria seized the lands around Lwow and Krakow while Prussia claimed the territories to the north and west of Warsaw. By the mid-18th century Poland, due to an inefficient and corrupt internal bureaucracy, had lost much of its autonomy to its aggressive and powerful neighbors: Russia, Austria and Prussia. The First Partition occurred in 1772 with Prussia occupying Poland's long coveted western territories, Austria seizing Galicia, and Russia taking part of Livonia. In the aftermath of the First Partition, the Second Partition was almost inevitable. Poland allied with Prussia to thwart the ambitions of Russia in the east. This, along with a number of other factors, lead to the War in Defense of the Constitution between Poland and Russia. Largely abandoned by their Prussian allies, Poland could not hope to stand against the powerful Russian military. Poland's defeat resulted in the loss of nearly 50% of its remaining territory to Russia and Prussia, who signed an accord in 1793. The Third Partition of Poland would dissolve what remained of the reduced Polish-Lithuanian Commonwealth, ending Polish all autonomy in the 18th century. Variants of this map were published from before the First Partition of Poland to this, it's last state, following the Third Partition. The series provides a fascinating overview of the dramatic transformation and slow dissolution of Poland between 1772 and 1795. All text is in English. This map prepared London by the firm of Laurie and Whittle and based on an earlier map of the region by D'Anville. Published by Laurie and Whittle in 1799 from their office at 53 Fleet Street, London, England. Laurie, R., and Whittle, J., A general atlas, describing the whole universe: being a complete collection of the most approved maps extant; corrected with the greatest care, and augmented from the latest discoveries, (London: Laurie and Whittle) 1799. Very good. Original centerfold. Blank on verso. Some offsetting. Original platemark visible. Old color. Rumsey 2310.048. OCLC 7160203. Phillips, P.L. (Atlases) 6008-22.